Mulberry HS junior, Arian Smith, has been on a roll this season. Last week Smith won the 100m and 200m dash at the Cypress Creek Invitational in a time of 10.49 and 21.47. This past weekend, the junior continued his undefeated season, running a new PR of 10.45 in the 100m to win the county title and set a new Florida No. 2 time and a PR of 21.33 in the 200m. If you're looking for some of the most talented hurdlers in the state, you need to look at George Jenkins. The depth of this program in this event is outstanding with four guys going 14.22, 14.55, 14.97, and 15.80. Not to mention they are led by two juniors who will have a returning season come 2020. 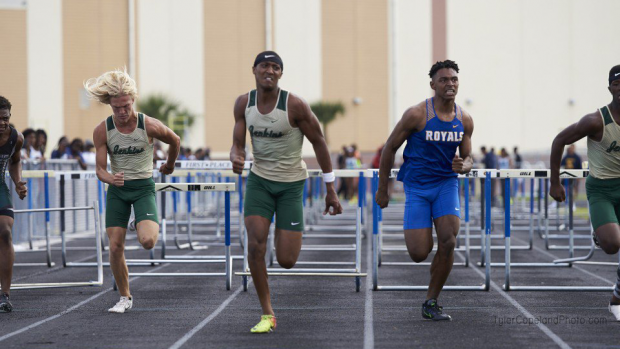 Tyson Williams came back after a strong win last week in the 110mH and 300mH at the Kowboy Invitational to win the county championship in a new PR of 14.22 and followed it up with another win the 300mH. Cathrina Morris and Tyra Thomas have been competing every race this season against one another. Morris, an Auburndale senior, finished second in the 100mH at last week's Kowboy Invitational in a time of 14.75. This week, she followed up that performance with a county championship win in the 100mH in a time of 14.54 and the 300mH in 44.63. Thomas, an Auburndale sophomore, won the 100mH at the Kowboy Invitational and finished second this week in the event in a time of 14.81 at the Polk County Championships. She also ran a season best time in the 300mH of 45.33 to finish second as well. Overall, a great day for the Auburndale duo as they collectively scored 36 points in two events. This 1600m, 800m, and 3200m will always be one of the most challenging triples, especially when events are back to back, like they are in finals. Lake Wales junior, Anderson Denton, was up for the challenge this week winning all three events. Denton won the 1600m in a time of 4:29.93 and he was followed closely by his sophomore teammate, Kevin Updike (4:32), George Jenkins' Brady Zimmerman (4:35.99), and Landon Morales (4:36.47). The Lake Wales junior, followed up the 4:29.93 with 1:58.56 win in the 800m with three of his teammates following behind: Ladarius Tellis (1:59.26), Michael Holden (2:02.69), Joesem Colon Torres (2:02.77). Denton wasn't done yet, after a 4:29, 1:58.56, he won the 3200m in a time of 9:35.65. Alicia Ruiz captured three county wins this weekend in the 1600m, 400m, and 800m. The George Jenkins sophomore won the girls 1600m final, after winning the 400m prelims, in a time of 5:16.34 with her teammate Anna Sentner right behind in a time of 5:26.72. Ruiz came back after her mile to run a 58.72 to win the 400m finals. She then jumped in the 800m and dominated the field, racing a 2:15.92, with Cristal Gomez, a freshman out of Frostproof, taking second in 2:25.92. Lakeland Christian has something special with their pole vault team. Senior Remington Musick won the event in a 4.28m (14-00) vault to repeat his performance from last week at the Lakeland City Meet. William Ott and Wyland Alleva, of George Jenkins finished second and third in the event with their 4.13m performances. On the girls side, Emily Branham, blew away the competition with her 3.53m (11-07) vault to win the county championships. Lauren Brown, out of Frostproof, was second in 2.78m (9-01.50).